Watching politicians jockeying for our votes during the extreme sport of presidential campaigning simply exhausts me. After each debate, I feel more compelled to give each candidate a gift certificate for 90 minute Swedish massage than mere cash. How do they do it? I keep asking myself. But I can't tear my eyes away from the spectacle. I'd be willing to bet that the percentage of an audience actually listening to content is far smaller than those who are watching the candidates body language, appearance and how they answer/dodge a question. But not all artists get tired, some actually turn it into art. 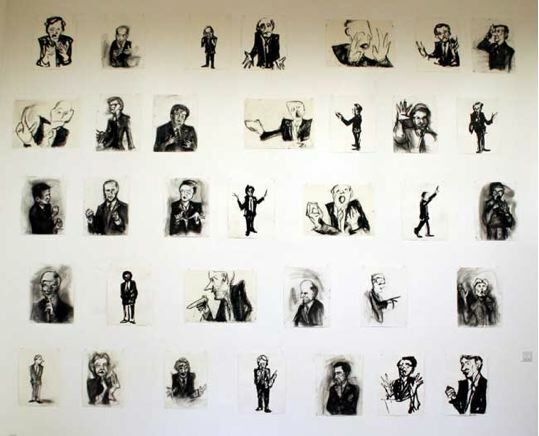 When artist Rachel Mason was invited to ride along with a reporter during this 2008 Presidential campaign trail she put what she saw to paper and created her show "The Candidate." Through a combination of performance pieces, sculptural figurines of ambassadors and warlords, and political sketches, Mason captures the decisive moments, gestures, and gesticulations of political leaders and candidates of contemporary times. 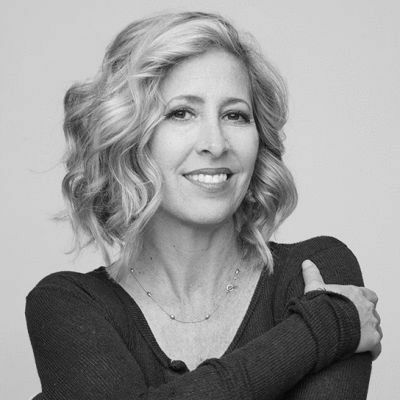 Through sketches and studies of spin-rooms and the political trail, she captures the frenzy that surrounds this election season. 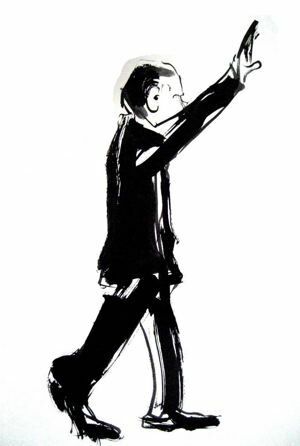 Mason studies these sketches and performs the iconic gestures and movements of candidates. Kimberly Brooks: Aside from general election fever everywhere, how did this particular show come about? RM: I had the opportunity to travel with writer Will Blythe on the 2008 Presidential campaign trail and I was given media access into spin rooms and other locations of political activity. I mounted an exhibition in Los Angeles at Circus Gallery entitled "The Candidate." 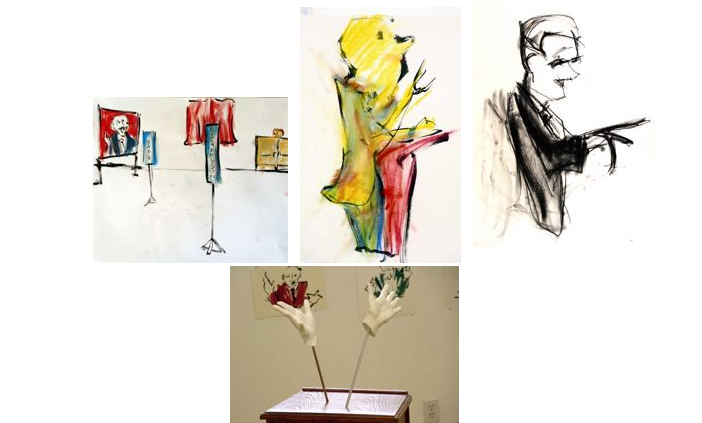 Will encouraged me to do something I had never tried before- to show my rough sketches. He saw in them something that I think was what I was also seeing in the politicians, their gestures becoming the actual portraits. I was drawn to the subject because power interests me, people who are in a state of trying desperately to attain it. A candidate seems to me to be in purgatory. Neither here nor there- desperate for the one thing that in all likelihood he will not get. KB: Do you think certain artists are in a similar state in any way, always trying to attain a new show or exhibition? RM: I definitely relate to the candidates as an artist. I think they have a momentary period in the sun when they try to create a portrait. They are desperate for you to have this image and they are a fleeting memory. I made several drawing series' which reflect the various states, "Hopefuls" (the beginning phase) "Monsters" the phase of aggression, and "Ghosts," the fading out of the limelight, and "Also -Rans," when they get shocked back into obscurity- away from being in the spotlight. I have images of the various stages. I also have other images of spin rooms, etc. My campaign journal is a few pages long and may be entertaining. KB: Besides thinking politically about your subject matter, how does it shape your process? RM: I write songs and I make art. I used to think that I couldn't and in fact many people still tell me that I can't and shouldn't do both. That I have to choose between practices- or careers. But more and more I am merging the two. I have a body of work called "The Ambassadors," which is a sculptural and musical project, and it also involves writing. 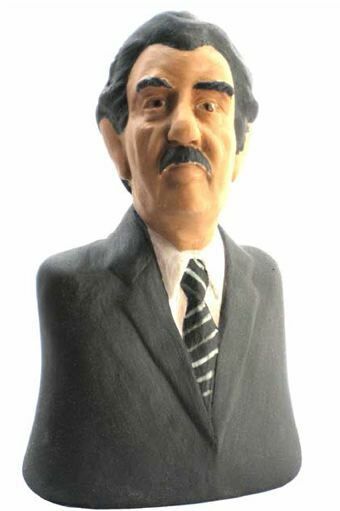 I have sculpted figurines that correspond to the leaders of wars during my lifetime and I created a figure of myself as an ambassador to each war. It led to my attempting to inhabit the minds of the figures and write songs, which I then asked other writers to do. I have two albums of songs now which were written as though inhabiting the minds of these political figures--the most recent album, "The Ambassadors Volume II," which includes the actual words of both Jimmy Carter, Saddam Hussein, and Manuel Noriega. Rachel Mason: Performance of "Candidate Mason's Inaugural Farewell Address"
Performance of "Candidate Mason's Inaugural Farewell Address" with sculpture podium "Microphone stand"
KB: You mentioned that people tend to think you need to choose between visual and performance art--how have your combinations been received? Or, how do you hope they are received? RM: I think one of the most enlightened responses to art is laughter. I never expect to make something funny, but I am always happy when something turns out that way. Humor is so complicated- it leaves you with questions. My favorite artists usually make me laugh. I can think of a few right now- Velasquez, Rodin, Picasso, Daumier, and two of my greatest heroes, the contemporary artists John Baldessari and Joan Jonas. KB: Has any work been inspiring to you in incorporating an element of humor to your art? RM: The portrait busts of Honoré Daumier- you can see them at a number of museums, the National Gallery of Art in D.C. has a set on display. I also like their titles such as "Jean- Pons Guillaume Viennet: The Artful One," "Joseph, Baron de Podenas: The Malicious Man of Importance," or "Baron Delort: The Mocking One." KB: Do you see any similarities between his work and your own? 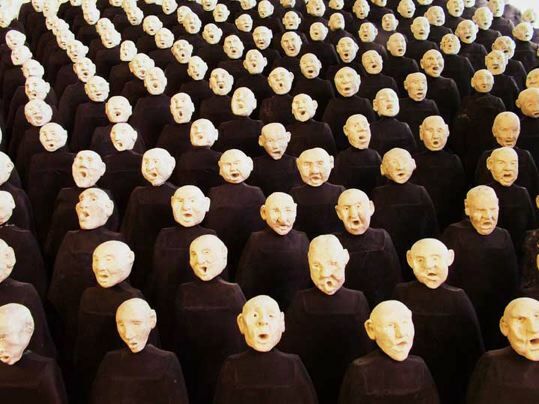 RM: I made a piece called Chiefs of State which depicts 191 world leaders singing in a choir, sculpting each world leader from a photograph, using my source the CIA World Factbook, which is where the title comes from. It was after I finished the piece that I became turned on to Daumier's figurines. I love them even more than his illustrations for which they were originally used I understand. They stay in my mind. KB: What is one of the first instances that inspired you to work politics into your artwork? RM: I was inside El Escorial in Spain and seeing the crypt of the Spanish Habsburgs including the tomb of Carlos II. I also went into the chamber which is at the top of this massive cathedral- in his room- it was surprising to see that a king lived in this humble and isolated stone building- so cloistered. It seemed like a miserable existence of the Habsburg rulers. I wrote a song imagining myself as Carlos II avenging his inherited mutations by not producing an heir to the throne. In addition to the song, I also made a sculpture of him as a terracotta potter- allowing him to be fertile. His inability to reproduce caused the destruction of the Habsburg empire. This image is my re-enactment of Carlos II seated next to the sculpture and a photo of my performance of his song at Newman-Popiashvilli gallery in New York. Left: Rachel Mason, Carlos and Sculpture, Newman-Popiashvilli Gallery, NY. KB: A Sculpture of Carlos II? Fantastic. Aside from their Royalty and magnificent threads, what made the Hapsburgs such great subjects? RM: The greatest artists painted and sculpted the Habsburgs in all their deformity. Their mutations were caused by successive generations of inbreeding. It was a system of maintaining power that backfired and Carlos is the most tragic case. The greatest artists of Europe painted them and it is through these portraits that you see their genetic disease forming, the Habsburg Jaw. The paintings of Carlos II by Velasquez, go through stages of his adolescense through adulthood and they maintain his subject's dignity while simultaneously revealing the perverse quality to his authority, there is almost something of empathy to these portraits, perhaps because Carlos was so physically and mentally damaged that it may have been hard to not feel a sense of pity for him. Rachel Mason is an artist and musician living in Brooklyn, NY. She received her MFA in Sculpture from Yale University in 2004 and B.A. In Art at UCLA 2001. 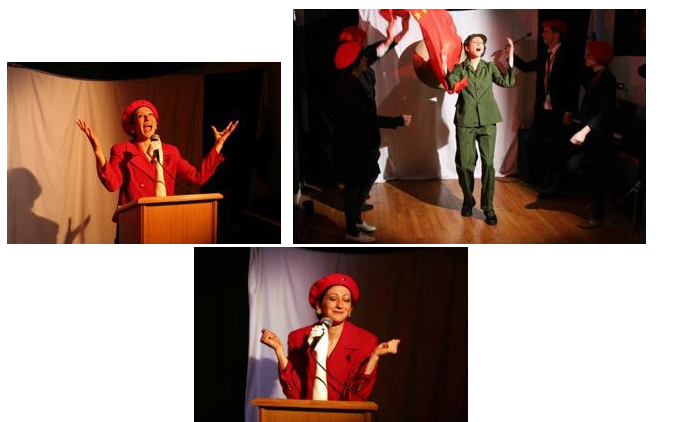 Her Los Angeles solo debut, "The Candidate" was at the Circus Gallery in Los Angeles. She has forthcoming performances at the Kunsthalle in Zurich Switzerland, February 28th and March 1st and will be included in an exhibit, "Under the Influence" Curated by Anat Abgi. Apr. 13, 2008 - Sun. Apr. 27, 2008 - Bard College, Hessell Museum of Art.